All the information you need before spending time on our challenge course. What is an element on the Challenge Course? We refer to each activity out on the challenge course as an element. We have both high and low elements out on our challenge course. 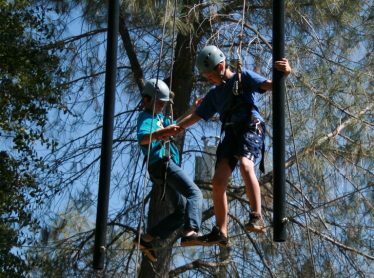 What is the difference between the adventure park and ropes course? The biggest difference is how the activities are structured. Participants go through many of the same elements but the goals are structured differently. A day on the ropes course is team/group focused and oriented, where as the adventure park is more focused on the individual. A day on the adventure park consists of our high elements; zipline, leap of faith, balance beam, climbing wall, and pipe dream. A program on the ropes course includes all of our high and low elements. Typically school groups, scout troops, and teams spend time on the ropes course and families and individuals sign up for the adventure park. What are the restrictions for the challenge course? There isn’t an age restriction but for many of the activities participants must be between 60-240lbs. We do our very best to accommodate everyone so if there is a special circumstance please contact us and we can discuss all the options. What is the difference between high and low elements? High elements focus on overcoming goals and pushing comfort zones for the individual. Low elements focus on challenging the team, testing their communication, cooperation, teamwork, cohesion, etc. For groups coming to Mother Lode we always encourage incorporating both high and low elements for a well rounded day. The adventure park can last 3-4 hours to complete all of the activities but these times can vary based on the participant’s abilities. For a group coming to the ropes course we can tailor the day to work within your timeline, although we recommend at least 4-5hours. Loose comfortable clothes based on daytime temperatures. The challenge course elements are located both in the shade and sun. We always recommend layering clothing to adjust to temperatures changes. Keep in mind late spring and summer time temperatures can be very warm so dressing accordingly is a must. Closed toed tennis shoes are a must. Safety is always at the forefront of our minds on any activity at Mother Lode. Our challenge course follows both California guidelines and industry standards. Our elements and gear are inspected both internally by Mother Lode staff and by outside Challenge Course inspectors. Participants who participate in our high elements will fitted with safety equipment and will be supervised by trained Mother Lode staff. Our course uses a belay safety system on high elements. How high off the ground is the course? The high elements range between 10-40 feet off the ground, while the low elements are typically only a couple of feet. The beauty of our challenge course is that high elements are designed in a way to accommodate everyone’s comfort level; whether you love being high in the air, hate heights, or anything in between. Anyone can participate and feel successful. We do our very best to run our challenge course in all weather but occasionally we will need to close the course for passing storms. Light rain or drizzle is fine but heavy rain and thunderstorms will temporarily close the course while the weather passes. Please contact us if you have any questions about our rain policy.